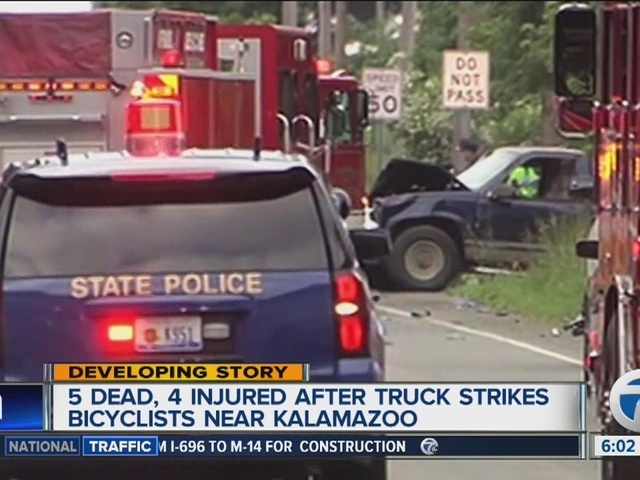 COOPER TOWNSHIP, Mich. (AP) — Other road users had complained that a pickup truck was being driven erratically just minutes before the vehicle slammed into a group of bicyclists in western Michigan, killing five, authorities said. 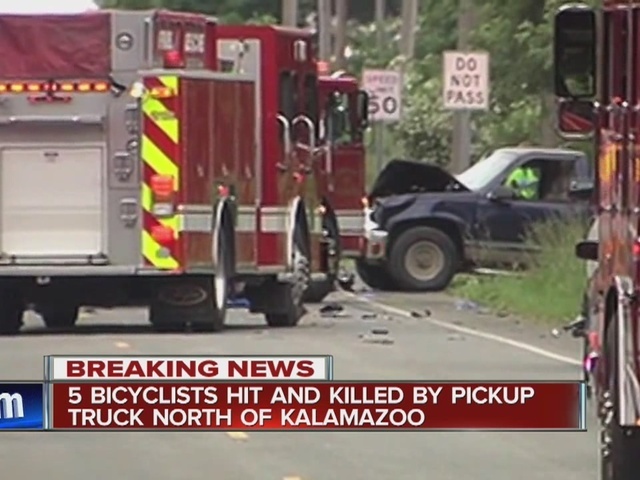 Four other bicyclists suffered serious injuries in the crash early Tuesday evening in Cooper Township and were being treated at area hospitals, Kalamazoo County Prosecutor Jeffrey Getting said during a news conference Tuesday night. The truck driver is in custody but has not been charged. "Our thoughts and prayers are with the families of the victims," Getting said. "I can't even begin to imagine what they're going through." The driver of the pickup, described as a 50-year-old western Michigan man, fled from the wrecked vehicle, but police caught him a short time later. Authorities began receiving calls about the blue pickup truck about 30 minutes before the crash, with people complaining "about the manner in which that vehicle was being driven," Getting said. He did not provide details of the erratic driving. Several agencies were searching for the pickup when the first report of the crash came in just after 6:30 p.m., he said. No officers were actively pursuing the truck at the time it crashed. The bicyclists had been riding as a group. Their names and ages were not immediately released because family members were still being notified. The group included men and women, but no children. Markus Eberhard was leaving a nearby park after fishing and said he nearly was hit by the pickup. He was unable to warn the bicyclists. "I saw a bunch of bikes hit the front of his truck and a couple of them flew," Eberhard told WOOD-TV. Paramedics and fire crews rushed to the scene, Getting said. He declined to answer questions about the suspect and said the man's name would not be released until his office has determined which charges he will face. Cooper Township is south of Grand Rapids and just miles from Kalamazoo. The area still is dealing with the random fatal shootings of six people and wounding of two others in February. Jason Dalton, 45, had been picking up riders for Uber at the time of the shootings. He is charged with murder and attempted murder. His attorney told a judge Monday that Dalton is expected to plead insanity in his defense.